Maysoon Zayid is a Palestinian-American actress, comedian, known as one of America's first Muslim women comedians and the first person ever to perform standup in Palestine and Jordan. She is also a social worker and does some amazing work with children. Here’s her story. I do a joke on stage that tells my story. I say “In the oppression Olympics, I would win a gold medal. I am Palestinian, Muslim, a woman of color, disabled, and I live in New Jersey”. I grew up with three older sisters in a small Italian Catholic town in New Jersey. I spent my summers in Jerusalem. My parents couldn’t afford physical therapy so they sent me to tap class. I blame that for the fact I ended up being a performer. Every day, I am hustling. In order to be a comedian, you have to write. So few people realize how much writing goes into doing comedy. I love my job. I get to cure the world making people laugh. I’ve been on the road for thirteen years so I’d love to settle down and have a talk show like Oprah. I am currently developing a comedy series. I am excited about getting back to acting and privileged to also be writing for the show. It’s called “If I Cancan,” stay tuned. My biggest challenge as a writer is that because of my Cerebral Palsy, I am awful at typing. I write everything in my head and hire someone to type for me. It’s frustrating when I get a great idea in the middle of the night and have to wait to tell it to my typist. I’m pretty good at not forgetting though, so that’s good. As a comedian, I’ve been blessed and lucky. The biggest challenge is the fact that men get paid more. I have never been discriminated against as a comedian, but I have as an actress. Hollywood shuns disability. We are the largest minority in the world and the most underrepresented in media. Often when you do see disability on TV, non-disabled actors are playing the parts. This is inauthentic and offensive. I initially was rejected admission by my local public school when I enrolled in kindergarten. They wanted to send me to a school for children with Down syndrome. My parents fought the system and won. I believe if I hadn’t been mainstreamed, I would not have the life or success I have today. I wanted to give that opportunity to disabled and wounded Palestinian refugee children also. Our main challenge is the Israeli occupation. it is hard to accomplish anything under violent oppression. Our other challenge is that there is very little early intervention. Even though these children have the ability, they lack the basic skills necessary for mainstreaming. Our goal was to use interpreters and technology so that kids with disability could be mainstreamed between the third and fifth grade. 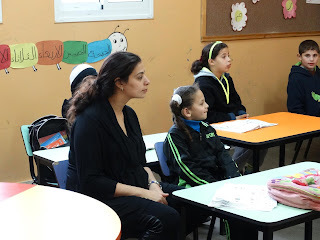 We are currently working with Al Shurooq School for Blind Children in Deit Jala, Palestine.